Allied forces are evacuated from Namsos. Chamberlain announces British forces are to withdraw from southern Norway. 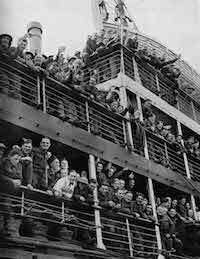 British Evacuation of Greece complete. Hostilities break out between British forces in Iraq and that country’s pro-German faction. Iraqis attack the British base at Habbaniya, but are repulsed. Admiral Chester J. Nimitz, convinced that the Japanese will attack Midway Island, visits the island to review its readiness. Admiral Fletcher, leaves the Lexington and her escorts to refuel, taking the Yorktown and her escorts and steamed north towards Tulagi. American bombers take time out from fighting the Japanese to fight Mother Nature; they bomb Hawaii’s Mauna Loa volcano in order to divert a lava flow from the city of Hilo. The Australian garrison on Tulagi is evacuated. SA Chief of Staff Viktor Lutze is killed. The actual cause of his death remains mysterious. Officially, he died in a automobile accident, although rumours persist that he was killed when German partisans ambushed his car. He is succeeded by Wilhelm Scheppmann. British teacher Leonard Dawe publishes crossword puzzle in Daily Telegraph using all five code names for the Normandy landing beaches—he’s placed under MI5 investigation. RAF Bomber Command, launch its last major action of war against Kiel. The British Second Army reaches Lubeck. The first lorry convoys carrying relief supplies to occupied Holland are allowed through German lines. The German Army in Italy abides by the Caserta agreement and surrenders to the allies, with hostilities ceasing at 12 noon GMT. General Weidling, the commander of Berlins Garrison meets with General Chuikov and accepts his terms of unconditional surrender of Berlin. The garrison in Berlin surrenders to 1st Belorussian and 1st Ukrainian Armies at 3pm local time. During the 2 week battle for the German Capital, the Russians suffer more than 300,000 casualties and while it is hard to estimate German casualties, the figure of 480,000 German prisoners says a lot.